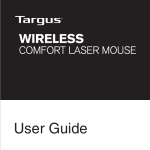 trademark or trademark of Targus Group International, Inc.
• Please use the two AA batteries that are included. to 33 ft (10 m) away. each battery match the polarity indicators inside the battery compartment. NOTE: WHEN THE BATTERY POWER IS LOW, THE TOUCH SCROLL WILL FLASH RED. 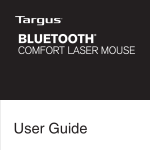 • Remove the mini USB receiver from the bottom of the mouse cover. to use the 4-way scrolling function. Touch Scroll to activate the quick scrolling function. Installing the software enables configuration of the programmable buttons. 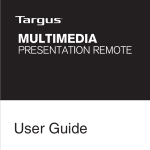 Double click the setup icon to launch the installation software. • You are ready to use the mouse. 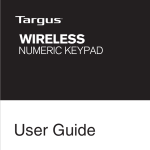 Click on the Targus logo to launch the device application. 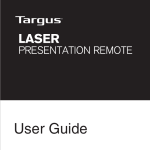 A Targus icon will appear in the System Preferences window. The mouse is not working. connections in the battery compartment. • Make sure the batteries are charged. Replace if necessary. • Verify that the computer’s USB port is functioning. • Try plugging the USB receiver into another USB port. Set the buttons to a specific function. Set the button to recall key strokes. Close the application window to apply the changes. void the user’s authority to operate this product.